Cup wont go to waste. Well at least not if Larry Ellison can help it. October 2nd when the official announcement is made! stops in Europe, Cowes in Aug and Marseille in Sept.
4 Boats, all same-same with identical battery supported foiling systems are ready, 3-4 more await in the wings for teams to claim them. Format will be fleet racing with a finale match race(s) to decide the series. A large purse for winner. Losers get participation ribbons. This will be a moving tour, utilizing mobile villages like the Volvo. There will be no permanent base. The ambition is to keep the thrill factor alive and encourage more team to participate in this state of the art technology that will wow even the most melancholy landlubber. Last edited by Photoboy; 09-23-2018 at 08:02 AM. It makes more sense than everyone going to Bermuda. SAN DIEGO (AP) — Former America’s Cup holders Larry Ellison and Russell Coutts are set to announce a new sailing league called SailGP that will be contested in an enhanced class of foiling 50-foot catamarans, a person familiar with the situation said Friday. The person spoke to The Associated Press on condition of anonymity because details won’t be announced until Wednesday night in London. Ellison, the software tycoon who co-founded Oracle Corp., and Coutts, a New Zealander, headed the Oracle Team USA syndicate that won the America’s Cup in 2010 and 2013 before losing it to Emirates Team New Zealand in 2017. They have been working for several months on the concept of an annual league that will keep alive their vision of competing in fast, cutting-edge catamarans. Plans call for SailGP to have five regattas in 2019, beginning in mid-February in Sydney, Australia. The other regattas are expected to be held in San Francisco, New York, Great Britain and France. 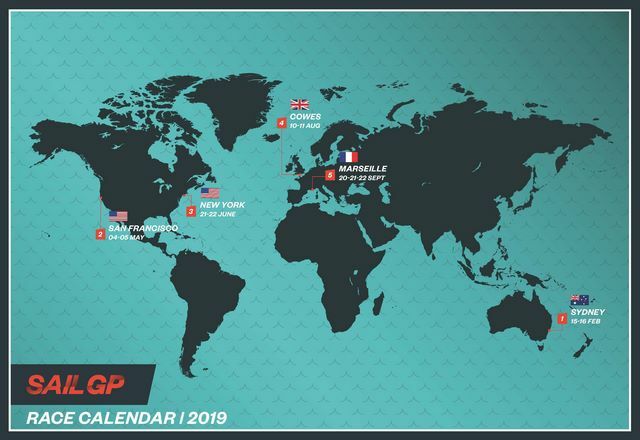 Reports have indicated there will be teams from the United States, Great Britain and Australia, and entries are also expected from France, Japan and China. While SailGP isn’t intended to compete directly with the America’s Cup, it will launch two years before the next America’s Cup, which is scheduled for 2021 in Auckland, New Zealand. 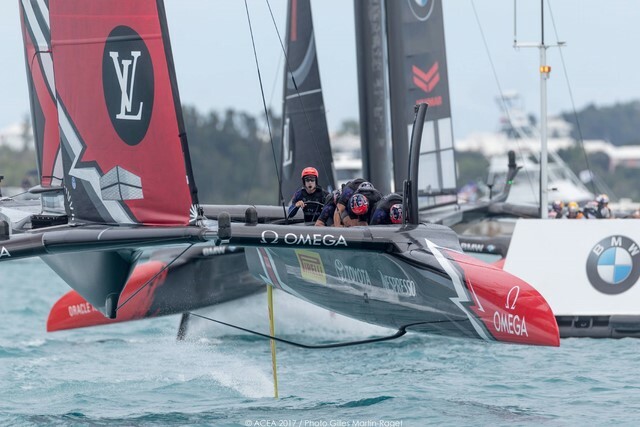 As CEO of the America’s Cup Event Authority prior to the 2017 regatta, Coutts championed continuity and stability via a framework agreement that called for matches in 2019 and 2021 in foiling catamarans. 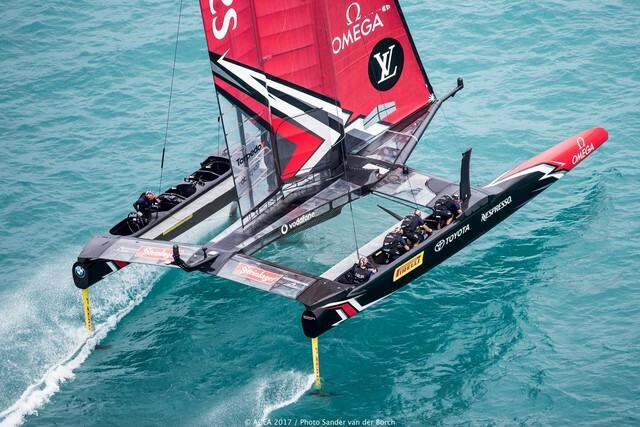 Emirates Team New Zealand was the only team that didn’t sign it, and the Kiwis, in conjunction with Challenger of Record Luna Rossa Challenge of Italy, decided to sail the 36th America’s Cup in a new class of foiling, single-hulled boats called the AC75. 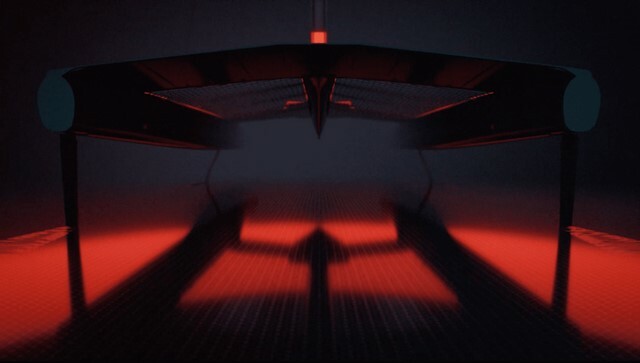 The SailGP catamarans will be called F50s — the F stands for foiling — and will be considered a new class. 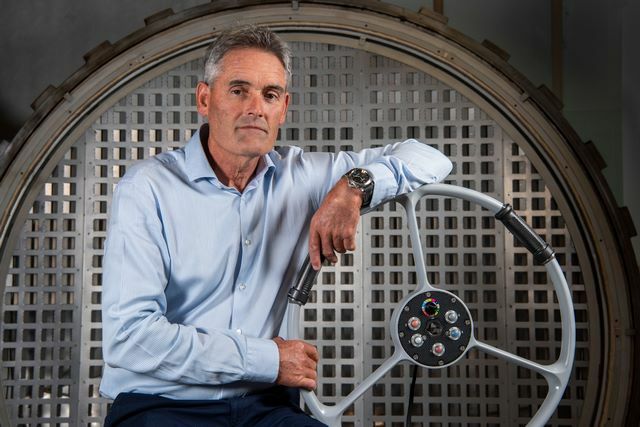 The fleet for 2019 will be a combination of AC50s used in the 2017 America’s Cup that were dismantled and redesigned, and new boats built in New Zealand. While they will look similar to the AC50s, they are expected to be faster and will be sailed by crews of five rather than six. The catamarans rise up on hydrofoils and skim across the tops of the waves. The GP in SailGP stands for Grand Prix. 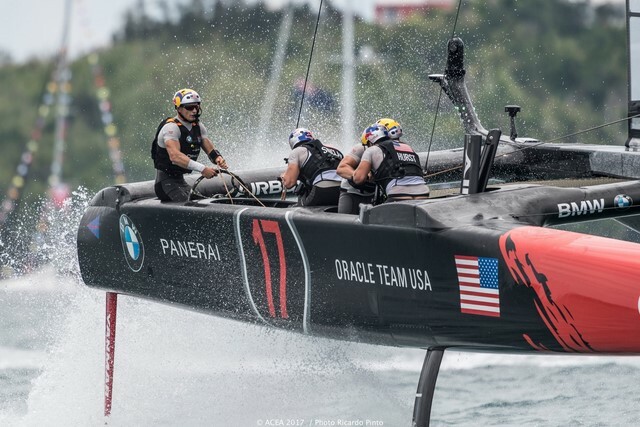 In recent years, top-level sailing events, particularly the America’s Cup, have compared themselves to auto racing’s Formula One due to radical technological advancements in boat design and TV-friendly formats. Coutts, a five-time America’s Cup winner, and Ellison first won the America’s Cup together when Oracle Team USA sailed a 90-foot trimaran to victory over Alinghi of Switzerland’s catamaran in a one-off match in 2010. They scaled back to 72-foot catamarans for the 2013 America’s Cup and then to 50-footers last year in Bermuda. While Coutts served as non-sailing CEO for Oracle Team USA, he previously won the America’s Cup three times as a skipper, twice with Team New Zealand and once with Alinghi. He sailed undefeated through three straight America’s Cup matches. Plans call for Ellison to financially back the league initially until it moves to a franchise model. The Australian team is expected to be headed by Tom Slingsby, who held a key role with Oracle Team USA in 2013 and 2017, and won a gold medal in the London Olympics. Last week, Sky News reported that Sir Keith Mills will have a role in running the British leg of the league. A spokeswoman for Mills’ Origin Sports Group declined comment but confirmed Wednesday night’s news conference. The American team could include Rome Kirby, a former crewmember with Oracle Team USA and the son of former America’s Cup sailor Jerry Kirby. I am curious as to where they will launch from in SF. That or Treasure Island would be my guess, IS pier 80 still an option? They need a shore side party location for corporate big wigs, unless they charter some large yachts. The pier at Clipper Cove is still intact, and Oracle has used TI for years for annual celebration. My money would be there. LONDON – SailGP today set out to redefine sailing with the launch of its new global racing league: five grand prix events featuring six national teams on identical wingsailed F50s – the world’s fastest, most technologically advanced catamarans. Spearheaded by Larry Ellison and Sir Russell Coutts, in season one, SailGP will bring intensely competitive, high-speed inshore racing to fans in Sydney; San Francisco; New York; Cowes, U.K.; and Marseille, France, as world-class crews compete for the championship trophy and a $1 million prize. The F50 is a revolutionary new concept in sailboat racing. A showcase of cutting-edge technology developed over the past 10 years. Powered by a 24-meter wingsail and flying above the water on hydrofoils, the F50 marks a huge step forward. The new upgrades are expected to produce a 15 percent performance gain across most racing conditions compared to the AC50 class of 2017. The F50 is predicted to exceed 50 knots of boat speed. The entire fleet has been extensively modified with new foils and board cases, new rudders and elevators, new hydraulics and electronics, a new cockpit layout for five crew, a new steering system, and a new flight control system operated by a joy stick. The beam fairings and systems have been refined to allow more efficient pack up and assembly. The foil rake, cant, wing twist and jib sheet adjustments will be powered by battery, making it possible for them to be adjusted by at least three crew members. The wing sheet adjustment will be powered manually by the two grinders. Rudder pitch will be actively controlled allowing the trim/attitude of the boat to be set irrespective of the ride height. SailGP is sailing redefined. Established in 2018 and headquartered in London and San Francisco, SailGP is an annual, global sports league featuring bold, cutting-edge technology and awe-inspiring athleticism. The fan-centric, inshore racing takes place in some of the most iconic harbors around the globe and culminates with a $1 million winner-takes-all match race. Rival national teams from Australia, China, France, Great Britain, Japan and the United States battle it out in identical supercharged F50 catamarans, engineered for intense racing at electrifying speeds exceeding 50 knots (nearly 60 mph/100 kph). SailGP is sailing redefined. Established in 2018 and headquartered in London and San Francisco, SailGP is an annual, global sports league featuring bold, cutting-edge technology and awe-inspiring athleticism. The fan-centric, inshore racing takes place in some of the most iconic harbors around the globe and culminates with a $1 million winner-takes-all match race. Rival national teams battle it out in identical supercharged F50 catamarans, engineered for intense racing at electrifying speeds exceeding 50 knots (nearly 60 mph/100 kph). SailGP will utilize short-format, inshore stadium racing to maximize impact and excitement. Each grand prix will include two competition days featuring a total of five fleet races leading to a final match race between the two leaders. Points will be accumulated in each race throughout the season, culminating with a final match race between the top two teams for the SailGP Championship, with a USD $1 million purse and trophy presented to the winning team. SailGP racing is sanctioned by World Sailing, and boasts an internationally acclaimed race management team headed by Regatta Director Iain Murray, Olympian and former America’s Cup helmsman. Richard Slater, one of the world's top international judges and vice chairman of the World Sailing Racing Rules Committee, is serving as chief umpire and chairman of racing rules. In addition to relying on its sailing experts, SailGP will utilize modern electronic race management and remote umpiring to ensure consistency, fairness and safety. SailGP’s nationality rules are currently being finalized by World Sailing. While the majority of SailGP teams will be fully comprised of athletes native to the country they are representing, select countries without the experience necessary to safely and competitively power the F50 boats will be provided a pathway to build to 100 percent nationality. In season one, China and Japan will be designated as developing teams, and will start with a 40 percent nationality requirement, which will increase by 20 percent annually. On the individual side, the nationality rules will be narrow, and sailors will not be eligible to compete for more than one country, with a variety of criteria required to satisfy nationality requirements. SailGP is built on the talent and athleticism of its world-class crews, and their safety is the league’s top priority. The boats are engineered, and the competition is formatted for fast-paced, intense racing. But SailGP is also setting new safety standards, with the latest technology and clothing, equipment and training all geared toward keeping its stars safe. SailGP is being fully underwritten by Larry Ellison, a passionate sailor who has been personally and financially committed to the growth and advancement of sailing for multiple decades. The framework for the league will mature over time as it becomes commercially viable and with the adoption of a franchise model. In an effort to reduce operational costs for all teams and avoid duplication of personnel and facilities, shared services will be utilized in a number of critical areas. On the sailing side, design, shore logistics, boats and equipment transportation will be handled by SailGP. A number of business and commercial services will also be provided centrally. SailGP has appointed Whisper Films as its global production partner to deliver exciting and impactful programming to broadcast rights holders throughout the world. With a goal of widening appeal and growing viewership, SailGP broadcasts will highlight personality-driven content, and enhanced pre- and post-race analysis. Programming will be available in a variety of formats with a focus on free-to-air television and OTT platforms, and will feature an augmented version of the LiveLine™ technology that to greatly enrich the viewer experience. Starting by season two, SailGP will launch global youth sailing programs to leave a sporting legacy in each market. The youth programs will provide opportunities for young sailors to develop via school programs and yacht clubs, creating a pathway to professional racing. SailGP strongly believes in respecting and protecting the ocean and surrounding environment, and is committed to responsible intentions and practices. Sustainability efforts are and will continue to be a priority for SailGP, and an initial goal is working toward the elimination of plastic waste during all races. After 12 months of hard work, we are excited to announce our involvement with SailGP as supplier of wingsailed foiling F50 catamarans and support services for SailGP. - Outfitting of new one-design electronics, hydraulics, steering and control systems. As part of the platform upgrades, the connections of beams, fairings and systems have been streamlined to allow more efficient assembly, pack-up, and maintenance so that the boats can efficiently move between different continents and venues. The scope of work for SailGP includes that Core Builders Composites will be constructing future modifications on an ongoing basis, as part of a planned development program to ensure the boats continue to evolve and remain at the cutting edge of sailing/performance/development. This has been a massive project for Core Builders Composites and we appreciate the support of our suppliers in making this happen – including MS Engineering, Pure Design, C-Tech, Doyle Sails and Rayglass. A special thanks to Northport and Marsden Maritime Holdings who have provided essential support and have been key to ensuring that the sea trials involving six international teams will take place in the ideal location of Northland New Zealand. We are looking forward to seeing these boats race again!